Dead insects may seem like a problem only for the bug, but their presence impedes the smooth flow of air over an airplane wing. Like most agencies, NASA is always looking for a way to combat bugs, or problems, in its systems. 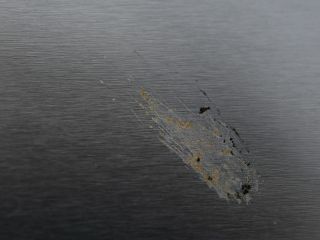 Sometimes those bugs are actually bugs — tiny insects that go splat on flying craft. All those insect guts stuck to the outsides of planes and other vehicles can be a literal drag, increasing fuel consumption and pollutants. In an effort to combat the problem, researchers at NASA — called the 'bug team' — recently tested coatings to reduce the amount of insect contamination on the wings of commercial airplanes. An effective coating — sort of like Teflon for bug guts — could reduce the amount of bugs that stick on the plane, which could lead to lower flight costs. Researcher on NASA's 'bug team' prepare test surfaces to attach to the wings of NASA Langley's HU-25C Falcon aircraft before a flight through the sticky late summer weather in Virginia. NASA's 'bug team' tested a variety of coatings on NASA Langley's HU-25C Falcon aircraft, putting the plane through takeoffs, landings and low altitude flights. Bug accumulation generally occurs from the ground to 1,000 feet (300 meters) altitude. Each flight required the researchers to attach surfaces covered with engineered coatings, as well as an uncoated surface to function as a control, on each wing. "We fly controls and assume that if the other surfaces were not coated, they would get the same density of bug strikes," Mia Siochi, a materials researcher at Langley, said in a statement. After testing eight different coatings, the team found that the trial surfaces had fewer splats than their control counterparts. In addition, the sticky splatters on the test wings were smaller than those on the controls, minimizing the disruption to the flow of air over the wing. Don't look for these coatings on commercial airliners anytime soon, though. To be cost-effective, the coatings will need to last through years of operation in all sorts of weather. The most promising coatings are undergoing tests that subject them to the environmental conditions that they would ultimately be subjected to. "We have to get through that hurdle of practical application of these materials," Siochi said. Fellow researcher John Gardner, who rode along on the flight tests to keep an eye on the coatings and watch for anomalies, didn't seem to mind working with insects in the hot, humid Virginia summer. "I've done other research projects, and this is definitely the most fun I've had," he said.